Brian Burkhardt (American, b. 1971) brings a variety of experiences to his creative work. Growing up on Long Island, he spent time exploring the woods and streams around his home. His career began as a commercial farmer before he started an organic farm, a business that introduced him to the often complex ecological relationships between such things as worms, insects, and plants. His interest in and concern for our environment continues to inspire his art. Burkhardt's work is rooted in a love of hybridization and Darwinian trickery. Mimicking the natural order of the world, his manmade specimens are titled in Latin and presented in terrarium globes or under glass bell jars, both reminiscent of natural history and botanical museums. 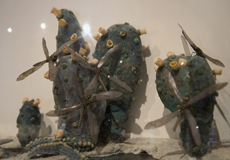 Other works are pinned to a flat surface or installed on a wall, inferring the work of the entomologist who collects and organizes insect specimens. Through his re-creations, Burkhardt explores the symbiotic relationship of humans, ecosystems, the flora and fauna of the living world, the impact of technology, and the adaptation of species in contemporary environments. moss doesn't grow on rolling stones a vision of nature features work from different series, each exploring concepts of adaptation, mutation and symbiosis. From the New Crop series are works with whimsical names yet serious connotations of how humans have been able to alter and morph nature. The pair of jellyfish in the exhibition, Unidentified Mutated Jellyfish with Grocery Bag Camouflage and Transporta Enrootus B.Burkhardt (Transport Jellyfish) utilize the discarded grocery bag as it might be seen floating in the ocean, or as a flotation device for transporting other creatures from one place to another. Burkhardt's commentary on these evolutionary tactics is both satirical and cautionary. The free-standing works, Shopping Cart and Rocking Chair are objects from daily life that are in a process of decomposition or mutation. 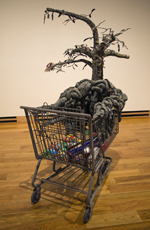 Shopping Cart holds the raw material from which the artist created the tree-like form growing from it; Rocking Chair has been impregnated with mushrooms in a method similar to that used by commercial mushroom farmers. Both suggest cycles of nature, food production, and human consumption. All of these works have been created in Burkhardt's geodesic Dome, reminiscent of the scientist's laboratory and the artist's studio. It is a place of creative exploration and invention. In it, evidence of the artist's working process, specimens in progress of construction, and the raw matter from which Burkhardt creates his imagined view of nature may be seen. For the University of Wyoming exhibition, Burkhardt has created a new work that was inspired by Wyoming's environment. Take-Heed is a collection of two different caterpillar forms, a male and female species, one with the word "take" and the other with the word "heed" inscribed on their bodies in Braille. Separately, the words infer opposing actions: "take" implies the human ability to take from nature without forethought or concern for long-term consequences while "heed" suggests a more cautionary approach. Together, the expression "take heed," suggests a calling for awareness about our interactions with and actions upon our environment. Burkhardt received his Diploma of Fine Arts from the School of the Museum of Fine Arts, Boston, Massachusetts. He lives and works in Miami, and has exhibited extensively throughout the United States. He is represented by Gallery Diet. Funded in part by the UW Program in Ecology, the National Advisory Board of the UW Art Museum, Wyoming Public Radio, and the Wyoming Arts Council through the National Endowment for the Arts and the Wyoming State Legislature. Center: Brian Burkhardt, Shopping Cart, abandoned shopping cart, mixed media, 48 x 36 x 75 inches, Installation view of Shopping Cart at the UW Art Museum.